During the course of Part 4 of this course I had come to realise that my previous perceptions of some artists were through lack of knowledge about either the artist, the technique or even just the period and this was certainly the case regarding Joseph Wright. 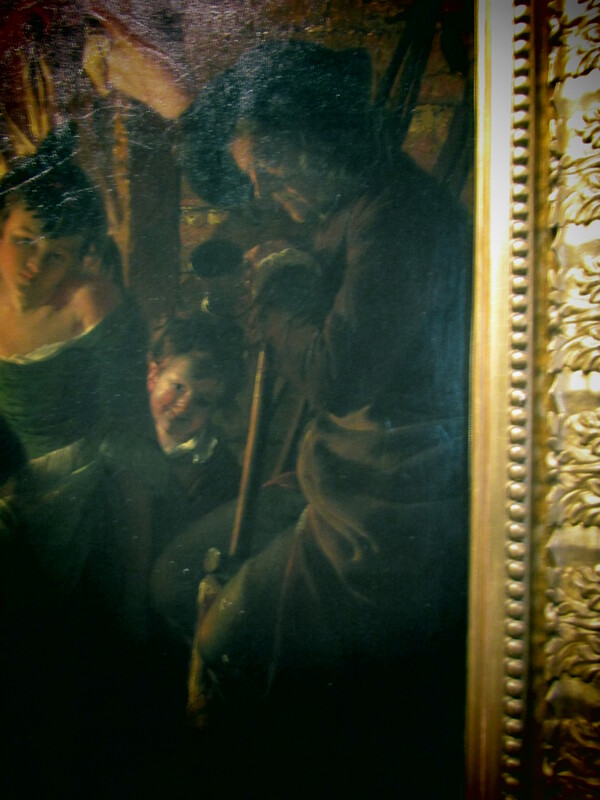 I have lived in Derby for over 15 years and have visited Derby Museum and Art Gallery many times and consequentially been through the Joseph Wright Gallery on several occasions and never really paid the works a lot of attention as I felt they were not to my personal taste. However in the last few years the gallery has been redecorated and the paintings rehung and they are looking to improve how they are viewed still further so that paintings are not above eye height and the lighting may be something they look at. Last week I felt the time was right to visit again – my reading had improved my knowledge to a degree combined with the fact that Joseph Wright was a key painter of the Industrial Revolution and I can honestly say I walked into that gallery and on the very first glance at the incredible works of art in front of me I broke into a huge grin! Suffice to say that first glance and I knew my opinion had changed because what I saw before me during the first view around the works was an artist of supreme skill and exquisite rendering not just of machinery or tools but of fabrics on clothing or portrayal of landscapes or just his portraiture. 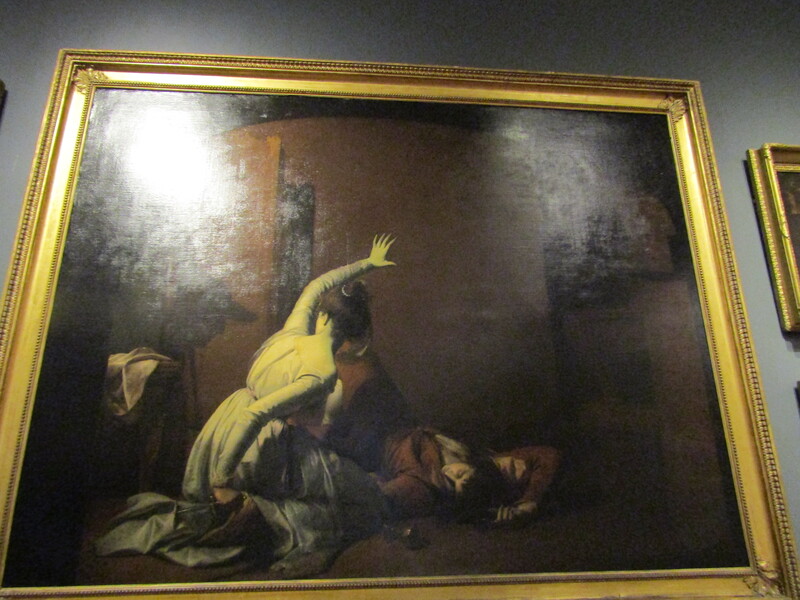 So who is Joseph Wright? since I moved to Derby I have been aware of the artist being born locally and growing up to take an active part in the local life and the pride of the city of him is evident including one of the university campus’s being named after him. He was born on 3 September 1734 and died 29 August 1797 in Derby and established himself as the first major British painter with a career outside of London. Apparently he trained under Hudson (Thomas – an English portrait painter) in London in the years 1751-3 and 1756-7 before setting himself up back in Derby as a portraitist. 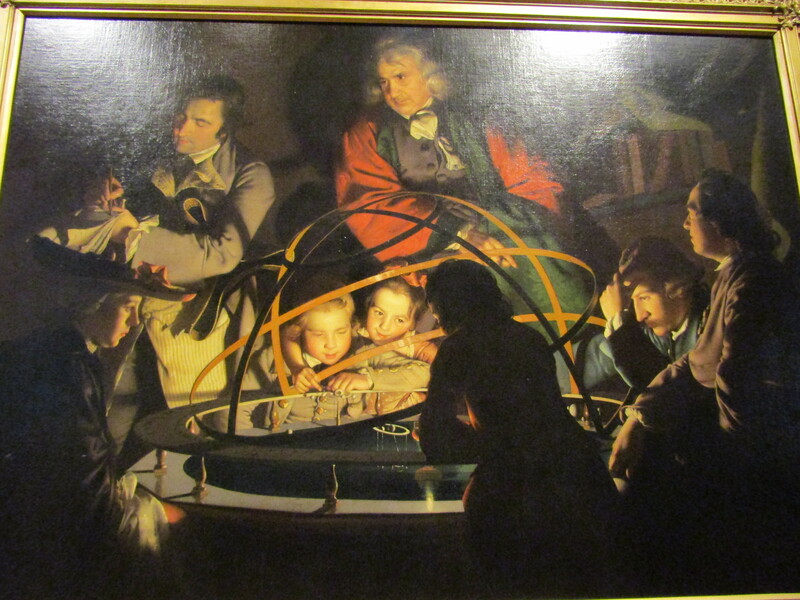 However Joseph Wright also had a clear interest in the local industry and gained a firm reputation as a painter of nocturnal scenes of industrial and scientific life and these paintings are what struck me the most on walking into the gallery. He exhibited these works at the Society of Artists in London and eventually was on their Board of Directors between 1769-1771 such was his influence. However Wright also exhibited at the Society’s rival the Royal Academy but fell out with them due to the a disagreement on how they displayed and treated his works – many others also did the same including Thomas Gainsborough. Consequently Joseph Wright became one of the first British artists to set up his own solo exhibition and did so in Covent Garden in London. So I guess now for the works that most appealed to me in the gallery – I have not gone for the ones of the highest repute but this is my personal choice and I list them in the order of my preference rather than chronological. A Blacksmith’s Shop. Oil on canvas. 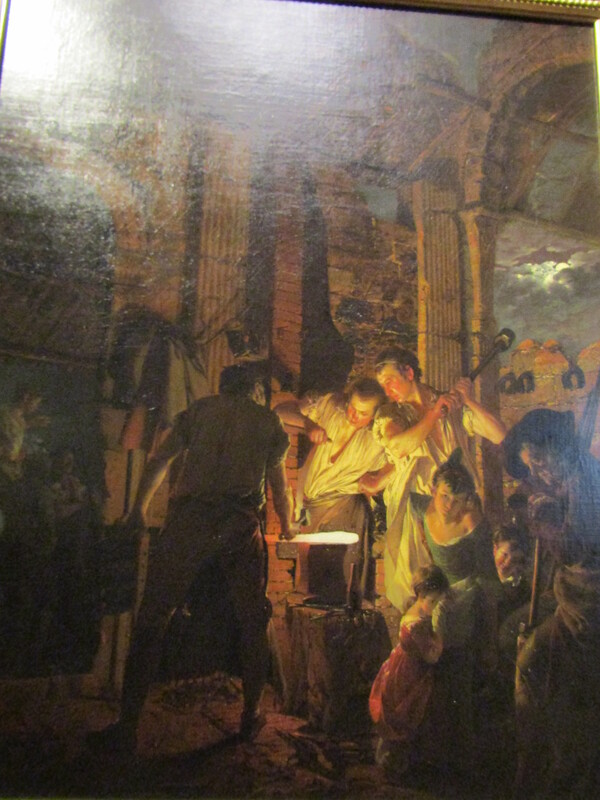 1771 but exhibited 1772 – this is the second one of 5 on the same theme and Joseph Wright has taken a mundane and urban scene and elevated it something that is deemed heroic. I am particularly drawn to this image due to the sheer detail – the rendering of the stonework and wood in the background of the building really caught my eye. I had already noted on first entering the gallery his use of the moon in many of his night time scenes which evokes the atmosphere of the nocturnal scene. I also took note of the children’s gaze in the lower right corner – a look of boredom from the girl as she stares out at the viewer with the younger boy almost mischievously looking from behind her skirts whilst the youngest girl hides her face in shyness or perhaps from the heat. I question whether the elder gentleman is the customer and perhaps their grandfather. I also noted the detail and the stance of the blacksmith’s themselves – you could almost feel the heat and the sweat that was coming off them as they went about their work with the hot iron. As you look look closer you get to see the tools of their trade hung up on the walls on laid on the floor and the people that are just outside of the building on the left hand side. This is a work that evokes emotion and a strong sense of you standing in one corner looking on rather than just being a viewer looking at a painting. The brushwork and colours are rendered with a delicacy of touch and the strokes themselves barely visible. Lastly I noted the rendering of the fabrics and textures throughout the whole painting – the drapes of the shirts or skirts in particular. This painting has a real depth and sense of mass and does not feel that it is two dimensional. My next choice was The Widow of an Indian chief watching the Arms of her Deceased Husband. Oil on Canvas. Exhibited 1785. 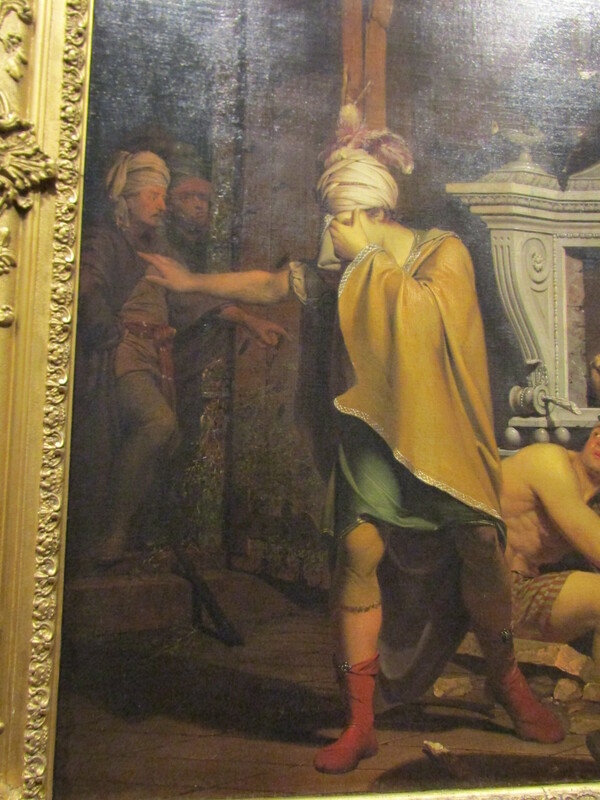 Apparently this piece was one of those painted for Wright’s solo exhibition after his departure from the Royal Academy and so was done to assert his public reputation and independence. 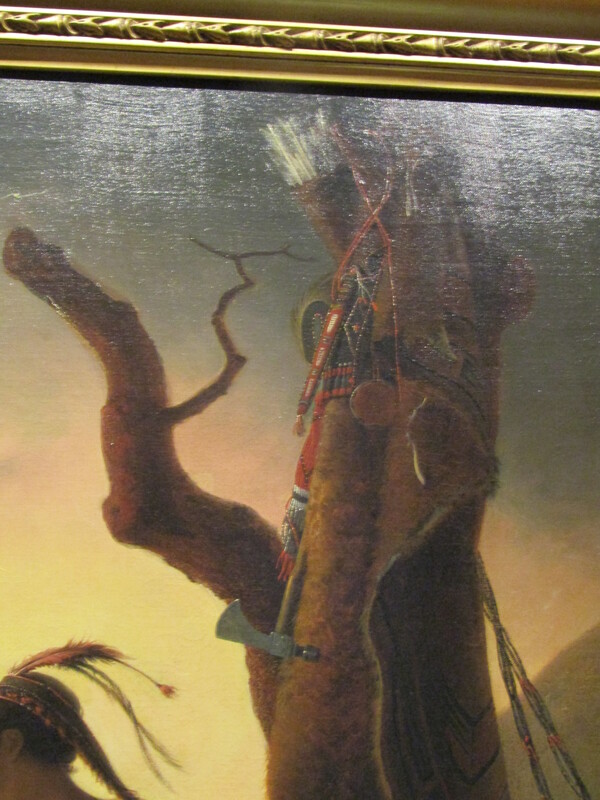 According to the information Wright obtained the information for this work from James Adair’s History of the American Indians 1775 and possibly through his friend William Hayley who was a Sussex poet. In accompanying information on the painting it is stated in his catalogue at the time he writes “This picture is founded on a custom …. where the widow of an eminent warrior is used to sit the whole day, during the first moon after his death, under a rude kind of trophy, formed by a tree lopped and painted; on which the weapons of the dead are suspended. She remains in this situation without shelter and perserveres in her mounful duty at the hazard of her own life from the inclemencies of the weather”. I have a long held interest in Native American history as both my brother and father are not American citizens (my parents emigrated over 20 years ago and my brother 18) and consequently the fact that this is also thought to reflect on the loss of America after the War of Independence has particular meaning to me. There is a companion piece to this – The Lady in Milton’s Comus – which is in a gallery in Liverpool and like many of Wright’s paintings of solitary women they are full of what is termed ‘stoic resolve’ in the information. I spent some time studying the details of this work and was particularly entranced by the details of the weapons of the widow’s late husband. 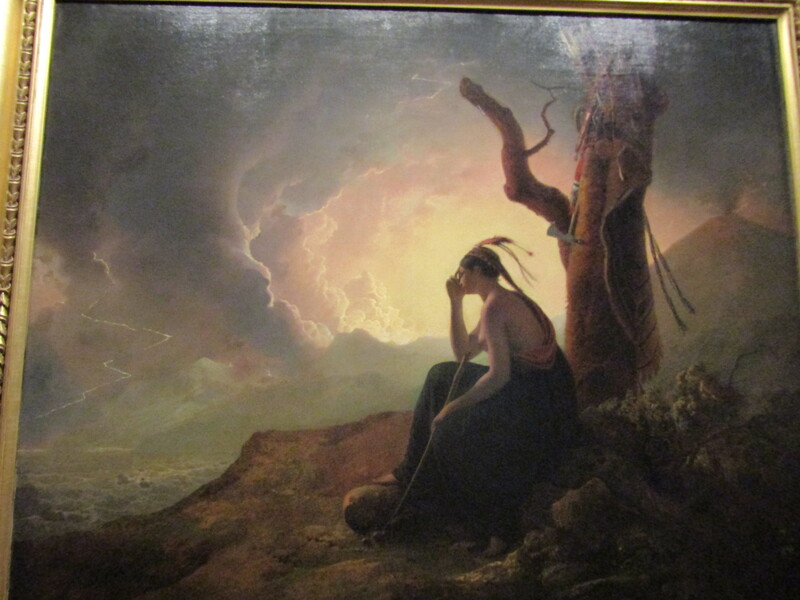 Like the other paintings in the collection Wright was able to convey a sense of mass and volume with his use of chiaroscuro and although he never visited America he has clearly studied the weapons of the Native Americans. The light in the painting is rendered with almost a feeling of the dawning of a new era as the widow looks mournfully across the ocean towards perhaps a distant land lost in her own thoughts. I took note of the way the widow is sat – for me she almost has a Classical quality about her that gives her a feeling of being heroic in her loss. The textures at the base of the tree are clearly done through careful study of nature and by this time Wright had painted his first landscape and this for me is reflected in this work. Overall this is painting that speaks of loss and sorrow and the fact that the focus is solely on the widow and the tree beneath which she sits with no elaborate background other than the sky and the ocean in front just gives it more atmosphere and a stronger emotional meaning – if this does represent the loss of America then the message is strong and without doubt speaks more than words could ever say. I note the fact that the setting of the scene is in a vaulted ceiling room and this strikes as possibly a former church or similar and the nocturnal atmosphere is further enhanced by the room being lit by the brightness of the moon. 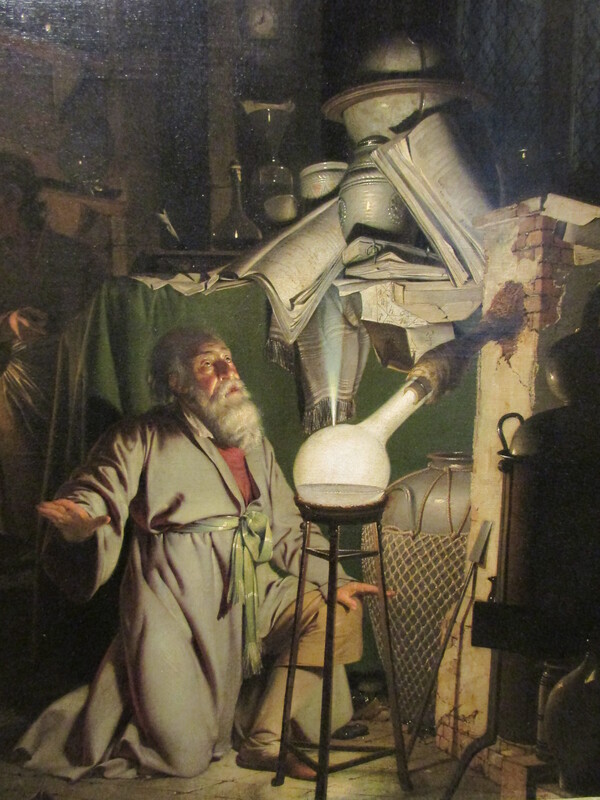 When you study the painting you are struck by the intricate details including the texture on the silver vessell behind the experiment or the jars on the shelf as well as the other tools and equipment in the room. The faces of each person are carefully lit which gives a feeling of life and the use of shadow contrasting with light enhances this. I am again entranced by the rendering of textures and the use of colour to give the sense of depth and three-dimensions as well as the use of perspective. Wright’s training as a portrait artist is clearly evident in his rendering of the figures and in particular the faces – each are realistic and naturalistic in their tones. 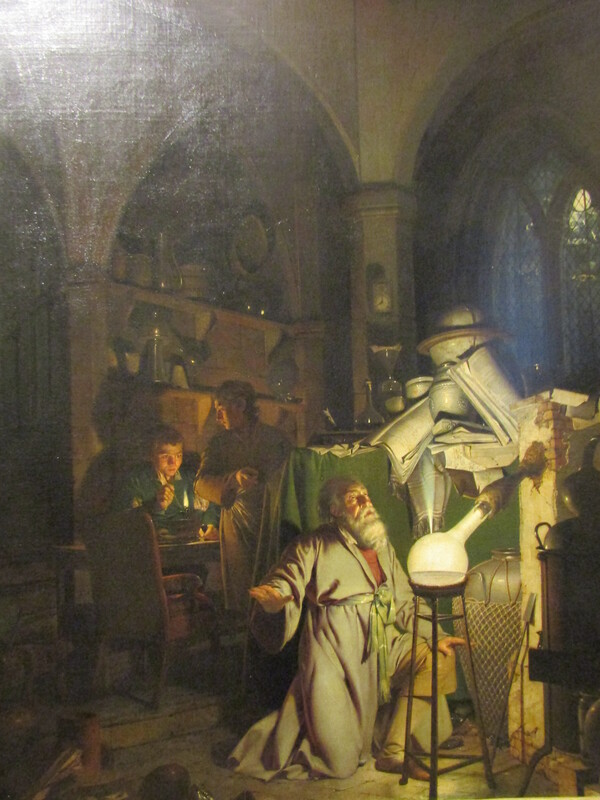 I could quite easily go back and study this picture further to do a separate annotation on this alone such is the detail – you notice different elements each time you look and as I write this I notice again the clock giving an indication of it being 11.40 pm at night – this for me gives a further element of atmosphere as the alchemist and his assistants work long into the night. A Philosopher Giving that Lecture on the Orrey, in which a Lamp is put in the place of the Sun. Oil on Canvas. 1776. This is one of the most famous of Wright’s works and justifiably so – it is a large and the second of three works which established his reputation as both an original artist and one skilled in painting artificial light. 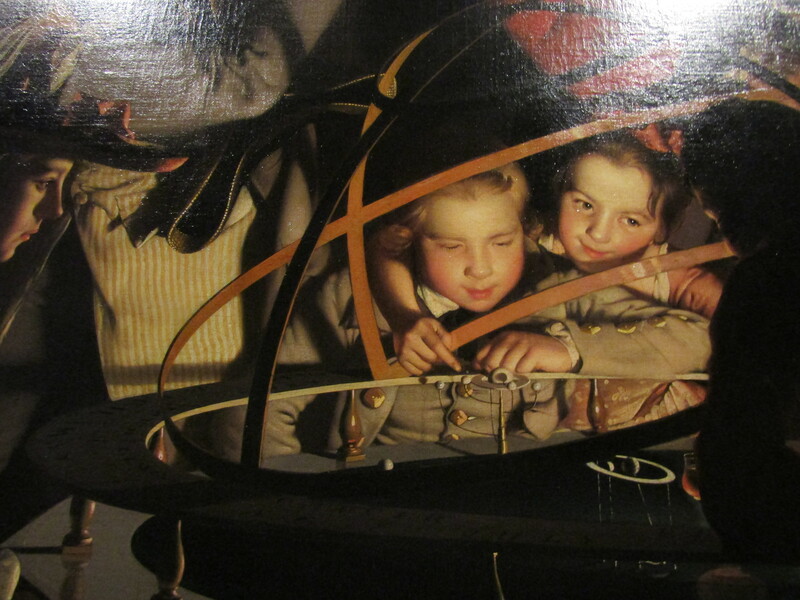 This for me is as much a portrait as work about a scientific experiment and the expressions of wonder on the faces of the children is one of the first things that you note. The whole image is one of interest and awe at the science in front of them but again my interest is drawn to the rendering of the fabrics – Wright has managed to capture the quality of the clothes of the clearly wealthier members of the society and he gives the impression of silks or high quality cottons and wool with great effect. I am intrigued by the expression of study but also a slight lack of interest on this lady but also was in awe of the detail of the pattern on her fabric at the bottom of her cloak. As you look you also notice the writing on the scientific equipment and the other details. 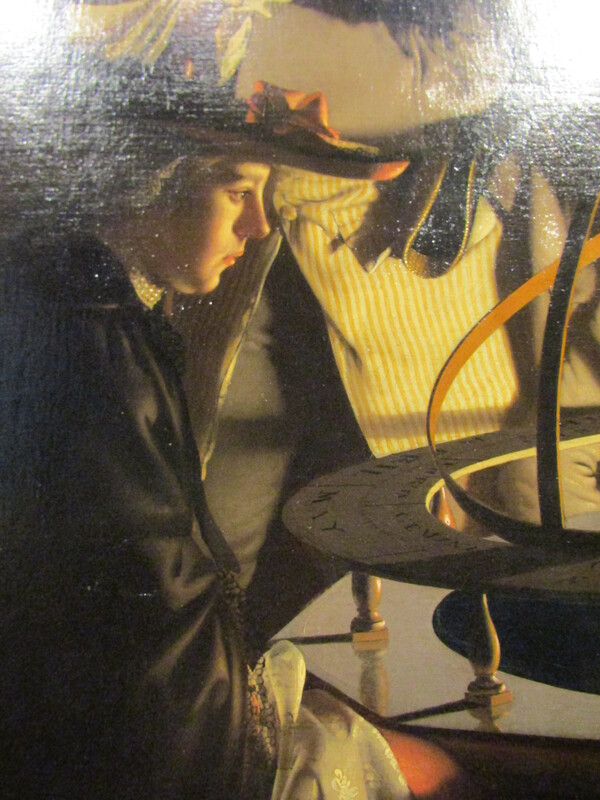 There is no sense of flatness in the work and the skillfulness of the chiaroscuro has given that sense of depth and mass that by now you have come to expect from Joseph Wright. I find the people in this picture slightly idealized but at the same time naturalistic but I wonder if the idealized nature comes from the artificial lighting in much the same way as it is known that candlelight or soft lighting softens features in photographs even now. However the faces on the children I immediately felt that these were done as direct portraits – there is a familiarity about these children and I wonder if they are in fact the same children featured in other paintings – this is something I will go back to the gallery and have a further look to see if in they are featured in portraits too so I question whether these children were personally known to Wright. I love the sense of awe and wonder as they look on with far more interest than the girl sat to their left – their faces are lit up to emphasise their amazement at what is in front of them. There is no harshness about this painting and if I had been given the choice of eras without knowing exactly which I would have chosen Romantic without hesitation – you are aware these are people of the Enlightenment and the way the work has been done in the painting style and the composition is that of the Romantic period. The last two paintings I have chosen feature people were more difficult to choose – I could easily just include the portraits that are numerous within the gallery but what is obvious to me is that I personally prefer people within scenes and effectively active as if capturing a moment in time. An History, Mirvan, a young Nobleman of Ingria, Breaking Open the Tomb of his Ancestors in Search of Wealth. Oil on canvas. 1772. This image was apparently drawn from John Gilbert’s Letters Concerning Taste (1771) which was a contemporary book of stories relating to the judgement of beauty and utility within the arts. 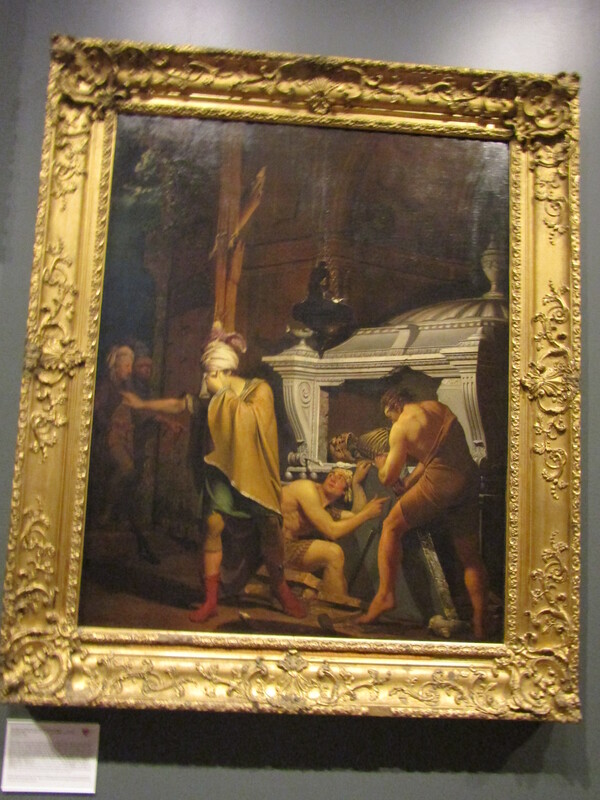 I did not know the story of Miravan and Croesus before reading in the gallery but this painting for me speaks of an interest in antiquity and almost feels as if you are intruding on the moment of horror and disappointment as Miravan recoils on discovering there are just bones and the fact that there is no great treasure. The tomb is rendered as one of great importance and clearly in a great church so Miravan’s emotions are further enhanced by the setting. The men looking on from the left of the work – peering around the door of the vault and these men are clearly captured as if clearly not surprised by what Mirvan has discovered. In this painting I note a much stronger use of colour and contrasts – primary hues of yellows and reds but with their secondary colours producing a harmony and uniting the work. In some of the previous works I have mentioned there is a use of neutral greys and fawns which are the soft uniting force in the images but here for me it is the stronger colours which also bring life and vitality to a scene where death reveals its secret. I had a conversation in the gallery about this piece and was in dispute with one lady about the fact that I do find the figures idealized particularly in reference to the grave diggers – they strike as very much of classical antiquity and there is no dirt or sweat portrayed on one of their faces as they open the tomb and this is in keeping for me for what is ultimately a mythological scene. I feel I must reference the detail in the background too – the rendering of the building enables the foreground figures to really be emphasized and gives the feeling of depth and dimension particularly with the lines of perspective. My other choice is one of a well known scene – that of Romeo and Juliet. The Tomb Scene. ‘Noise Again! Then I’ll be Brief’. Oil on canvas. Exhibited 1790. This is moment taken from Shakespeare’s play when Juliet wakes from her drugged sleep to discover her lover dead beside her and momentarily before she takes her own life. I do recall seeing this on previous visits to the gallery and liking the dramatic quality of the image. The lighting is subtle with emphasis on Juliet herself as the guard enters the room. Juliet’s body is very much in a contrapposto style although she is kneeling – she has more weight on one leg than the other as she is caught in surprise by the noise of the guard. The use of chiaroscuro gives the scene its dramatic atmosphere as do the muted colours – there is none of the bright hues used in the painting of Miravan. My photograph is not very clear as there are restrictions on use of flash in the gallery and also some of the paintings are hung above eye height which I have mentioned to a curator – this means sadly you are not able to see clearly some of the detail which is a shame because this work is as intricately detailed and studied as any other in the collection. There is clear use of strong line to emphasize the contours of the bodies whilst colour and tone are used to create form along with a subtle use of perspective where necessary. Overall this scene has a feeling of depth and great emotion and is one I will be going back to take a much closer look at. Interesting there are few landscapes – Joseph Wright was more known for his portraiture and his industrial scenes than his landscapes but the ones he did are highly skilled and exquisitely rendered as he experimented with various techniques. 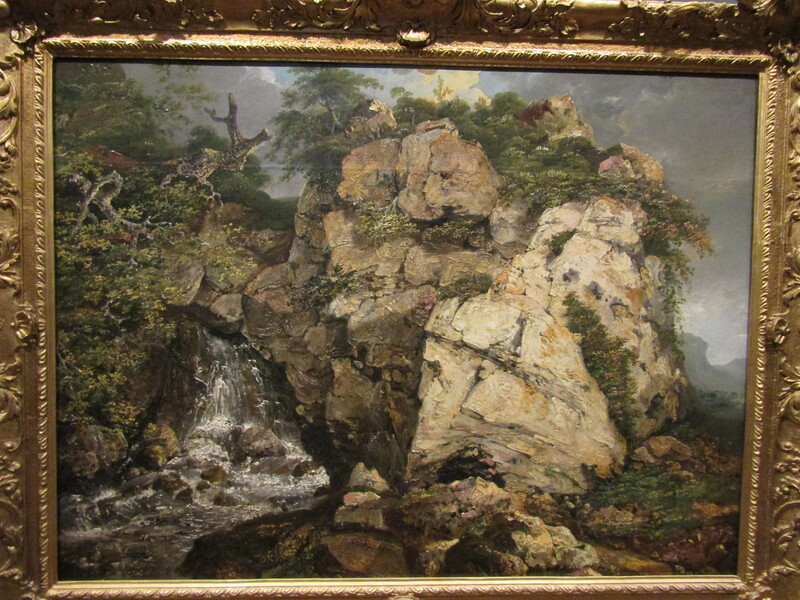 Rocks and Waterfall painted in 1772 is thought to be his first landscape. Oil on canvas. I did not need to read the information to be able to work out the techniques – it is obvious the background sky and some of the foliage is done with careful use of transparent and opaque layers of paint and glaze and using a brush to give the soft effects required. On the rocks and the waterfall though there is use of a palette knife and tips of the brush to create the textures of the rocks and waterfall and my photograph does not do the mastery of this justice. This is a painting that stands alone in its techniques and is the only one he painted in this style – the rocks are so realistic there is an incredible sense of size, texture and sheer solidity which is softened by the waterfall that you can almost hear the sound of. This painting has a personal draw for me as the reason I recognised the techniques used was my grandfather painted in oils and I now remember his paintings and realise for the two I grew up with in the hall of our home were done in a very similar technique – I question whether as an engineer he had come across the paintings of Joseph Wright at some point in his career and used them as personal inspiration for his hobby. Landscape with a Rainbow Effect. Oil on Canvas. 1794. 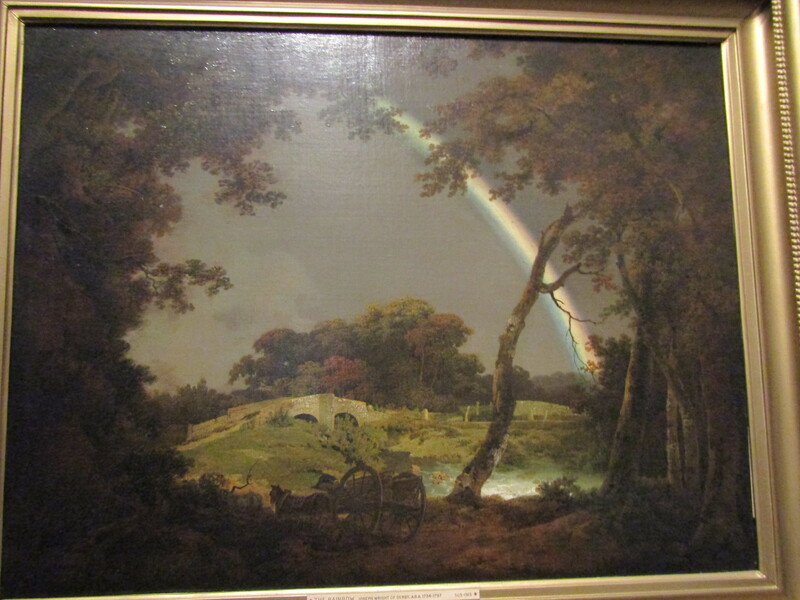 This is a painting whereby Wright was experimenting with painting a rainbow and it is thought this is his masterpiece for landscape works. He has carefully framed the scene with the foreground of foliage and trees with beautiful layering of colours and textures creating a sense of depth. The rainbow and bridge are further emphasized by the white in the near foreground – this is mentioned in the information on the painting and did not immediately strike me until you become aware of the clever effect it has in focusing your attention on the rainbow and bridge. The sky in contrast has been kept relatively uniform in colour in a deep tone which gives further emphasis on the rainbow and bridge – it creates the contrast that is needed for this subject but for me that mid tone of the sky is what brings the freshness the scene alive. I have to include one of the paintings Wright did of Vesuvius – he witnessed whilst Naples an eruption of some considerable size in 1774 and over the course of many years did no less than 30 paintings of the volcano. This painting is titled A Distant View of Vesuvius from Posillipo – oil on canvas – after 1789. 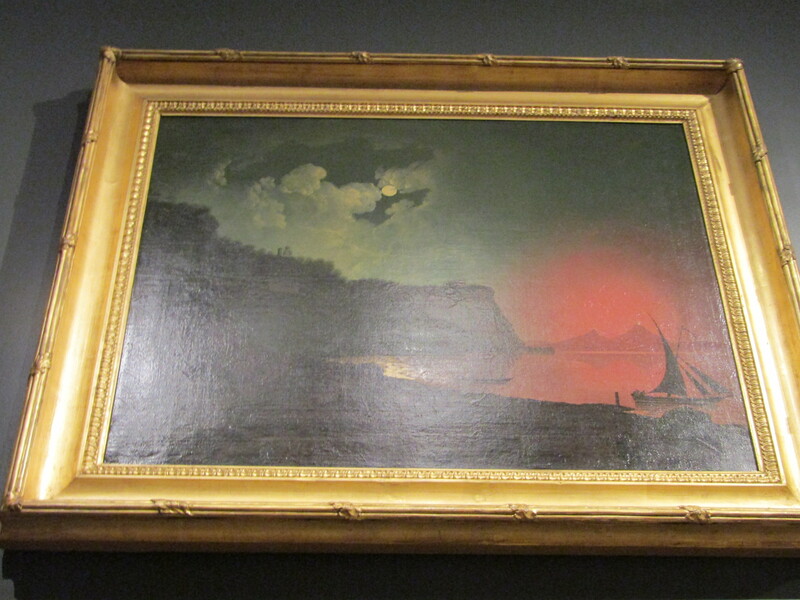 This is one of the paintings that is too high up on the wall for either a good photograph or being able to study well – however what I can see is an incredible use of colour to capture the eruption from the distant shore and the strong use of contrasts to depict the shoreline and the boat in the foreground. The red colour of the eruption contrasts with the green used for the sky coloured by the light of the moon but this colours brings harmony too. Wright visited the excavations at Pompeii and Herculaneum and like others of his time (and many of us in modern times too) was fascinated by the power of volcanoes. I love the fact that the moon is depicted in order to give the impression this is a night time scene and the volcano has literally lit up the night – the light of the moon and glow of the volcano is further reflected on the smooth calm sea. Apparently this painting is a copy of one made of Edward Munby whose family once occupied nearby Markeaton Hall near Derby. I could easily add in every single landscape, industrial and portrait image in the gallery – they were each as fine in their depiction of the scenes and the figures as the next and no one was less skillfully rendered. The work of Joseph Wright was astounding and is of no surprise he is so highly regarded but I have to end on the companion piece to Arkwright’s Mill I have already mentioned in previous work (I did an annotation based on it) – A View of Cromford Bridge. Oil on canvas. 1795-96. This painting along with that of Arkwright’s Mill is thought to have been painted speculatively before being sold to Wright’s agent Daniel Parker Coke – this information is in the gallery information. 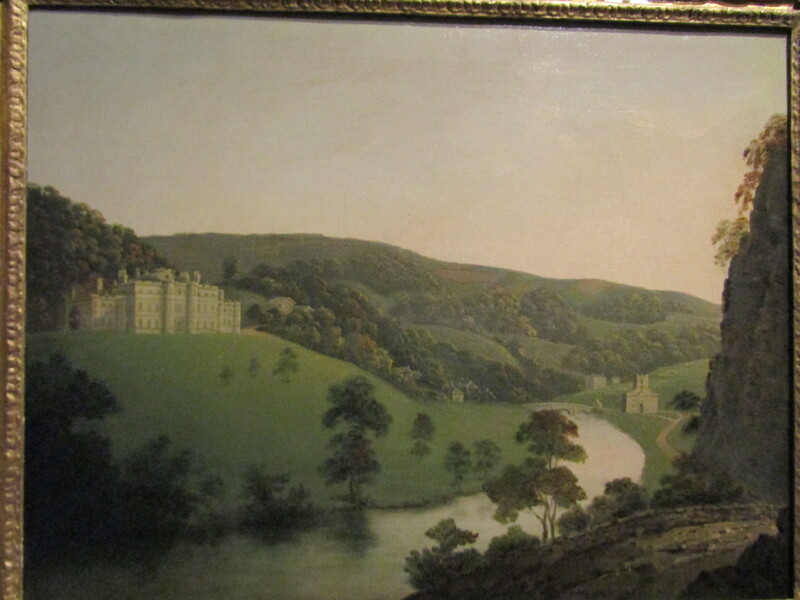 The building in the background is apparently Willersley Castle built by Sir Richard Arkwright using the wealth from his industry in cotton spinning and at the time of the painting occupied by his son and his family. The river is the River Derwent which goes past Cromford on to Derby which is 16 miles to the south. The scene is one of genteel English landscape with the indication of the new wealth created by the industrial revolution – the castle is caught in the gentle glow of evening sunlight. The size of this painting, along with that of Arkwright’s Mill is considerably smaller at 23 x 30 inches than many of Wright’s works but for me that is part of the appeal – the detail is no less for the size and the rendering of the landscape no less exquisite but somehow it captures the atmosphere of the valley and the countryside just that bit more. My personal view is that Joseph Wright captures the very essence of the Romantic era of painting whilst also the men and women of the Enlightenment and the advances of the Industrial Revolution whilst also having a keen and learned eye towards historical references and scenes. There can be no doubt of his skill as a portrait artist, as I have previously mentioned, but the scientific scenes or capturing of urban life in scenes such as those of the Blacksmith’s Shop are held in deservedly high esteem. My personal favourite is still the Blacksmith’s Shop with its focus on the hard labour of a typical country or urban scene but perhaps my choice is also influenced by my personal life long love of horses and for me an Blacksmith is primarily a maker of horseshoes despite the skills in metal work. This entry was posted in Research & Reflection, Visits and tagged contrapposto, Derby, Joseph Wright, oil painting, portraiture, Royal Academy, Society of Artists. Bookmark the permalink.